Planning a birthday party for your 11-year-old can take a bit of work, especially since his or her tastes and interests may have changed since last year. Luckily, you have many options to choose from in terms of party themes, food and entertainment. Be sure to plan some birthday games to keep your party guests occupied and happy throughout the event. Start the party off by setting the birthday atmosphere and playing this birthday-themed bingo game from the website, Party Game Ideas. 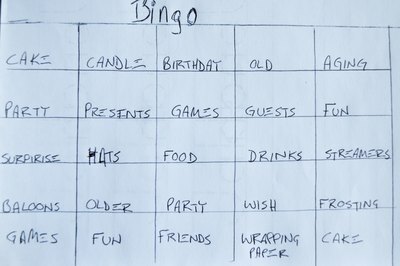 Before the party, create enough bingo grids composed of five squares by five squares for every guest. Within each square, write a different word associated with birthdays. Good examples include "cake," "presents" and "candles." Make sure you place the words in different squares on every bingo grid. When ready, hand the grids out and give a marker to every player. Begin calling out the birthday words. If someone has the word written on his bingo grid, he crosses the word out. The first person with a line of five squares crossed out (either diagonally, horizontally or vertically) he shouts out "Birthday Bingo!" and wins the game. Test your young party guests' senses by playing this party game from the website Party 411. Begin by gathering all the stuffed animals in the house. If you don't have enough, tell the guests to bring some of their own before the party. Hand a stuffed animal to every player. Tell them to spend some time with it and really get to know it. After about three minutes passes, collect the stuffed animals. Blindfold all the players and place the stuffed animals in a pile. Pick one player to start. She has to make her way to the pile and search for her stuffed animal. After she makes her guess, return the stuffed animal to the pile and let the other players have a turn. The players who found their stuffed animals win the game and get prizes. Play this trivia game with your 11-year-old guests to figure out who among them know your son or daughter the best. Work with the birthday kid to come up with questions and answers pertaining to his interests and experiences. For example, questions like "Which is the birthday boy's favorite movie?" and "Has the birthday girl ever left the country?" work well. Once you have plenty of questions, place the birthday boy or girl in front of the other guests as they stand in a line. Tell him to ask the easier questions first and move on to the harder questions later. As soon as a player answers a question, he either moves to the back of the line if he answered it correctly or leaves the line if he didn't. The last player standing wins the game.